Researchers from King’s College London analysed information on more than 7,000 members of the National Child Development Study, which follows people born in England, Scotland and Wales in a single week in 1958. They found that 28 per cent had been bullied occasionally and 15 per cent were bullied frequently at ages 7 and 11, a similar rate to today’s children. The researchers then compared people’s experiences of childhood bullying with blood tests,height and weight taken at age 45. Their BMI (Body Mass Index) and stomach fat were used to determine whether they were obese or overweight. More than a quarter of women who were occasionally or frequently bullied as children were obese at age 45, compared to around one in five of those who had never been bullied. Men and women who suffered childhood bullying also had higher levels of blood inflammation and fat around their middles, known risk factors for heart disease. Twenty per cent of individuals who were bullied frequently as children also had high levels of a substance called C-reactive protein (CRP). A high amount of CRP increases the risk of heart disease as arteries get clogged up with fatty deposits. Only 16 per cent of adults who were not bullied as children had high CRP levels. 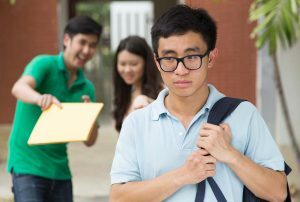 Professor Louise Arseneault, lead author, said that unfortunately, bullying was “part of growing up for many children”. She added that the findings should remind teachers, parents and carers to think about how to help the victims, and not to just worry about how to stop the bullies. “Our study implies that early interventions in support of the bullied children could not only limit psychological distress but also reduce physical health problems in adulthood,” she concludes.